One thing I hadn’t dare attempt was a vintage pattern. I had had a brief look before but the instructions left me cold so I left well alone. The sewtogetherforsummer hashtag changed all that. 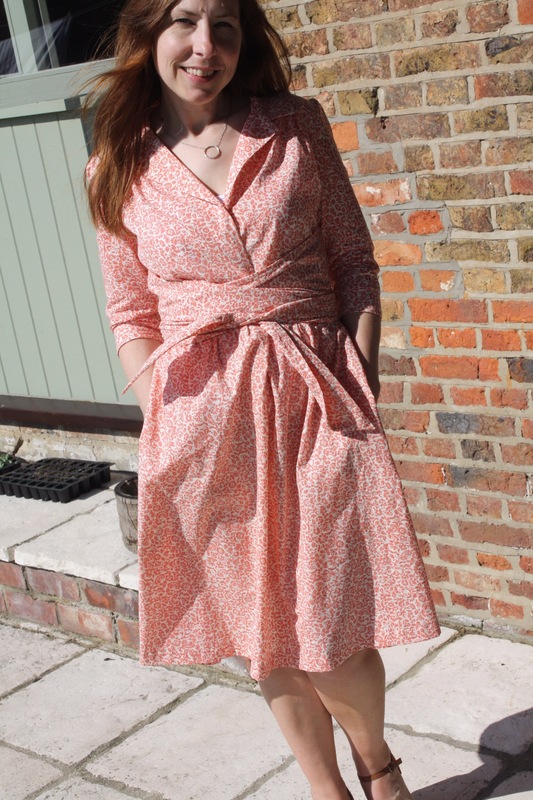 I began with a Sew Over It Vintage Shirt Dress and then a Megan Nielsen Darling Ranges and loved both of them. 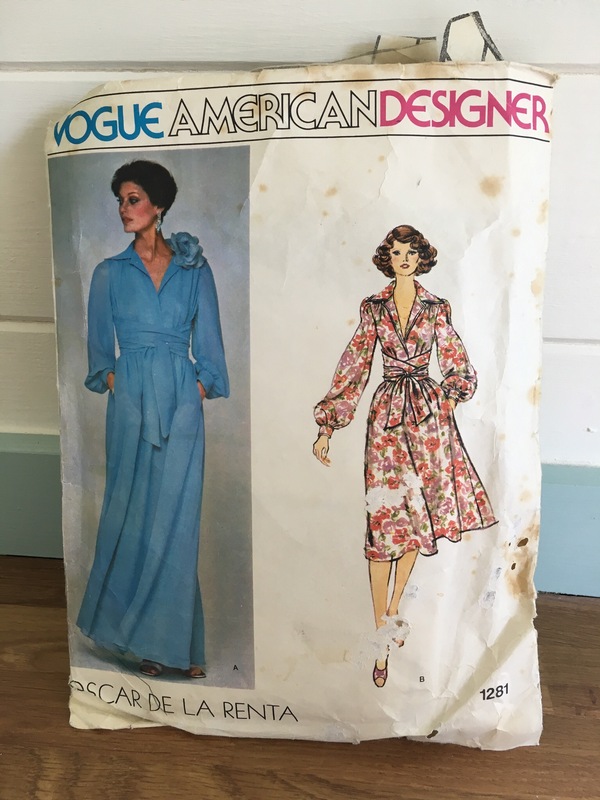 I then the found the Vogue pattern of all Vogue patterns. An Oscar De La Renta designer pattern that had some dubious stains on the packet, was a bit moth eaten but all the pattern pieces were there and…gulp..the instructions too! 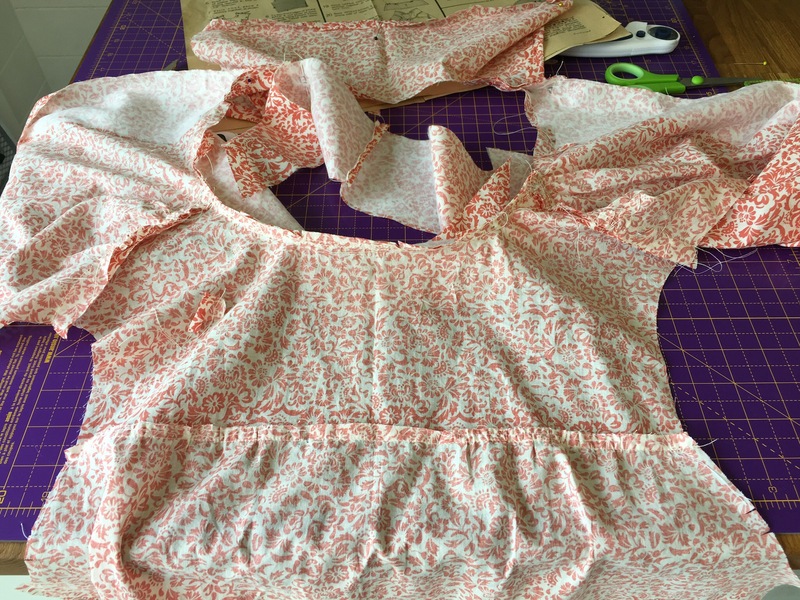 I cut out all the pattern pieces using a gorgeous coral and cream shirting fabric from Fabworks Mill Shop. 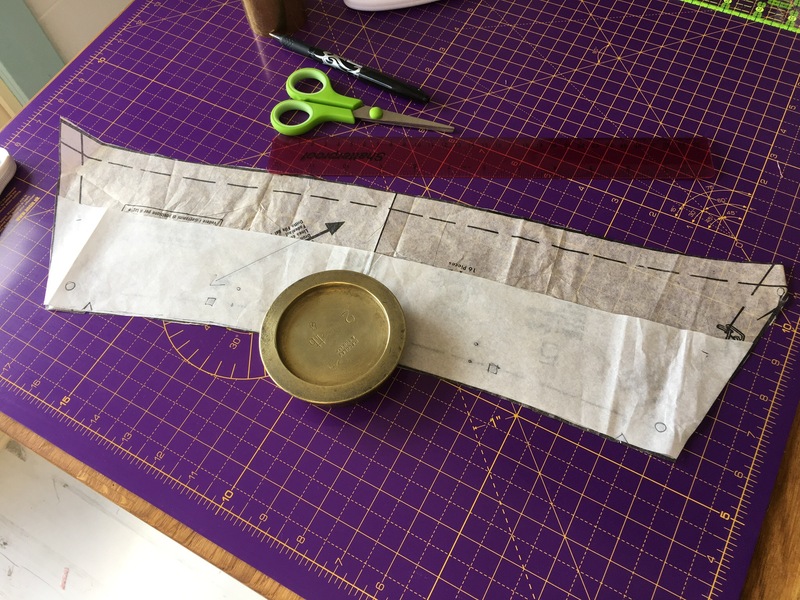 I decided that I didn’t want too many gathers on the back bodice so I moved the fold in a couple of inches making it narrower. Then I started on the collar, wowsers. As it’s a classic seventies design, the collar was a bit too Noddy Holder for me so I decided to shave some off. It ended up being pretty much half the original depth so that gives you some idea of how huge it was! The bodice went together surprisingly well, a few gathers and pretty straightforward. That is until I got to the front facing which eventually becomes the lapel. I somehow had to attach the the front facing to the upper collar and then flip it over and sew the two collars together. I looked at it, made a cup of tea, looked at it again, made dinner, went to work, looked at it again (you’re getting the gist). It seemed as if the more I read it, the more confused I became. The instructions seemed to be in some alien language that just teased me into stringing words together that made no sense what so ever!! Two weeks later I decided that I was just going to sew the damn thing and see what happened. This actually paid off but then I completely messed up where the lapel meets the collar. A few chosen words and screams later and I took a deep breath and cut out another bodice in its entirety. If I had made a toile this wouldn’t have happened so I have massively learnt from this! The second bodice went together better, more knowledge about its construction goes a long way. The nifty ties went nicely into the side French seams and the skirt was thankfully uneventful. The sleeves were also HUGE so I adapted them using the sleeves from the SOI Vintage Shirt Dress. I love the sleeves and think they compliment the dress perfectly. I have to say that when I completed this dress there was the usual sense of satisfaction but there was also something extra. A sense of achievement and a new found confidence that I had managed something much more complex than I had ever attempted before. I also genuinly love this dress and the fit is perfect!! Thanks Sarah, I certainly think you appreciate it more when you’ve had to work for it 😂 thanks for reading it!! This is lovely – your very own Oscar de la Renta dress! I really like the way you’ve toned down the 70s elements of the design to make it modern and wearable. Thanks Janet, I was a bit worried about changing the pattern too much but I think it paid off! It definitely did – such a great version!